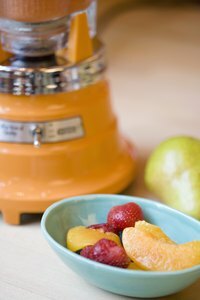 Whether you are making a creamy soup or you want to make your own baby food, a blender is all you need to puree the food to a smooth, liquid consistency. Blenders are also a more affordable option than more complicated food processors. You can easily puree soft fruits, vegetables and even meats with a little liquid in a blender. If you are using firmer foods, such as apples, potatoes or carrots, you must first soften them by baking or steaming. Prepare the food you are planning on pureeing by washing it and removing any skin or other inedible parts. For example, you will need to cut the stems off of tomatoes and peel oranges. Boil, steam or bake any firm foods until they are soft. These include vegetables such as broccoli and squash and fruits such as apples. Chop the foods you are planning to puree into bite-size pieces. Place the chopped food in the blender. Add enough liquid to just cover the food. Water is the most common liquid used, but you can use other liquids. For example if you are pureeing meat, you can use chicken or beef broth or gravy, and if you are pureeing fruit, you can use fruit juice. Secure the lid tightly over the blender and press the "puree" option on your blender. If your blender doesn't come with options, just press the "blend" button. Blend until the food and the liquid are well combined and completely smooth. Stop the blender, open the lid and stir to make sure no chunks of food are stuck under the blade. Then, blend again until the food is completely in liquid form.